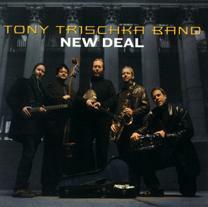 George Graham Reviews The Tony Trischka Band's "New Deal"
The banjo has certainly enjoyed a renaissance over the past decade, thanks largely to the considerable and rather surprising popularity of Béla Fleck and his unique Flecktones band. The New York native took the five-string banjo, an instrument almost exclusively associated with bluegrass, and, thanks his combination of astonishing technique and excellent composing, came up with a mind-bogglingly eclectic mixture of everything from bluegrass to funk to world music. But since long before Fleck launched his Flecktones, another New York State native has been exploring new territories with his banjo, Tony Trischka. One of the most influential banjoists since Earl Scruggs, Trischka was one of Béla Fleck's mentors, and first experimented with adding jazz and fusion influence to his banjo in the early 1970s. Influenced as much by Chick Corea and John McLaughlin as by Scruggs, Trischka first launched a band with horns and electric instrumentation around the time of the first wave of jazz-rock fusion in the Seventies. Over his career Trischka has explored straight bluegrass, the New Acoustic jazz and bluegrass blend through the group Psychograss, and was a founder of a bluegrass influenced band called Skyline that was a kind of outlet for singer-songwriter material. He also did a World Music album that involved members of the band R.E.M. And he also created a series of instructional courses for the banjo, which have been used by hundreds of aspiring pickers. Since 1997, Trischka has been heading The Tony Trischka Band, which has allowed him to get back to one of his early stylistic blends, bluegrass and jazz-rock fusion, not that far from the sound of his former student Fleck and the Flecktones. In 1999, the Tony Trischka Band released Bend, a fine CD that concentrated on the electrified banjo fusion blend, with a rock rhythm section, including guitar and a prominent saxophone. Since then, the personal lineup has changed, with the replacement of all but saxophonist Michael Amendola. But for their new release, called, appropriately enough, New Deal, the new players prove to be an even better lineup, and the material is exceptionally wide-ranging. There are also some interesting guest vocalists, including David Johansen, the former member of the outrageous punk-glam band the New York Dolls, and later known as lounge singer Buster Poindexter. Also providing vocals is veteran folkie Loudon Wainwright III, former member of the Story Jennifer Kimball, and Manhattan Transfer co-founder Laurel Masse. The new Tony Trischka Band roster includes guitarist Rolf Sturm, bassist Bob Bowen, who often plays acoustic bass, and drummer Scott Neumann. All have had experience in straight-ahead jazz, with Bowen having worked with Lee Konitz and James Moody; Neumann having performed with the Village Vanguard Orchestra big-band and the late organist Brother Jack McDuff. Guitarist Sturm, who also provides some vocals, has worked with, among others Billy Martin of Medesky, Martin and Wood, as well as singer-songwriter Maggie Roche. Saxophonist Amendola has released jazz CDs under his own name. He also was the composer of several of New Deal's tracks. This time, he also does some doubling on flute. For his part, Trischka explores a new instrument, a prototype National steel banjo, which is made like the metal National guitars favored by blues performers, and which Trischka plays in a similar way, slide style. Also this time, Trischka reaches back to bluegrass for some of his influences but he can also veer off suddenly from the bluegrass banjo picking to something with the musical complexity of the fusion players. The vocals are an interesting touch, and most work well. Trischka adapted two from verse found in books of traditional African-American poems and stories. Veteran banjo eclecticist Tony Trischka, on New Deal, his roughly 24th album, has created one of the best electric banjo fusion efforts outside of Béla Fleck's Flecktones. The new Tony Trischka Band lineup raises the level of musicianship from the last TTB CD almost four years ago, with more versatile players who inspired more wide-ranging material. The guest vocalists work our well and add a nice touch. While the last Trischka Band CD invited comparisons to former Trischka student Béla Fleck's Flecktones, who set a formidably high standard, this CD features a more wide-ranging sound that is as acoustic as it is electric, with compositions from both Trischka and saxophonist Amendola. The result is close to an hour of a satisfying music that marks a further broadening of banjo horizons. Our grade for sound quality is an "A." Although the dynamic range is somewhat more restricted than the last Trischka Band CD, the recording is well-handled with the acoustic instruments sounding clean, and the overall mix being very tasteful and free from gimmicks. The banjo is an instrument not well-known for its expressiveness, but in the hands of artists like Béla Fleck, Alison Brown and Tony Trischka, the instrument's boundaries seem almost limitless.